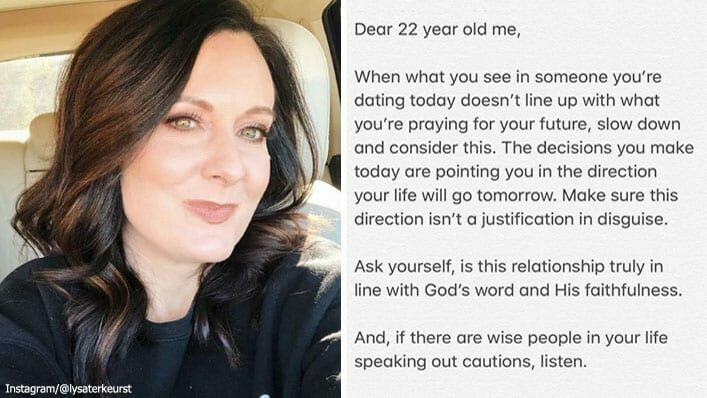 In a series of letters to her younger self, Lysa TerKeurst recently dropped some serious truth on love, life, and God that women across the nation are gleaning valuable wisdom from. Starting last month, The Proverbs 31 President began penning messages she has coined “Lysa Letters” to her 21 to 25-year-old self. The first, written on the topic of love, was perhaps the most enthralling for Lysa’s followers, particularly after the rocky road her marriage has been on over the past couple years. News of her anticipated divorce from estranged husband Art TerKeurst broke in June 2017 after Lysa revealed her husband’s infidelity and substance abuse led to their relationship demise. But about a year later, the once heartbroken Christian minister shared news of God’s redemption in her marriage as she renewed vows with her beloved husband. Then one day he whispered, “We must help others going through this. We must let God bring good from our story.” And I knew. I knew we had finally turned a corner in the long journey of healing. He wanted to lead the way for us to find purpose in our pain. And something about that honest humility gave my heart a soft place to land. Dear hurting one, we see you. We hear you. We read your comments. You are not invisible to us. Both… those who feel abandoned. And those who are trying to figure out restoration. We know the deep nuances of your pain. And as God leads, we are committed to inviting you in to what we’ve learned, what we know, and how to find the help you need to move forward. Make no mistake the light dancing in our eyes is not just a joy for us. It’s a wildfire, a battle cry, a high calling to help you…fueling something to come. Clearly, Lysa’s love journey paved by devastation, tears, and heartbreak was far outside the one she ever imagined or hoped for… but would she go back and change it if she could? So, the question remains, would the older and wiser 49-year-old still advise the naive 21-year-old of 26 years ago to choose the man she’s committed today? Did his actions back then reveal that he would be a man who would serve her well today, in spite of his period of unfaithfulness? You see, the key is not finding the perfect husband — one who never makes mistakes, fails you, or disappoints you. In that case, we’d all remain single ’til Christ comes again. It’s finding a man who, in spite of his shortcomings, allows his character and actions to be continually molded by the heart and hand of God. Does Lysa’s marital wisdom resonate with you in your own marriage? Share how the man the “younger you” chose shines through in your relationship today. For more “Lysa Letters,” check out what she wrote to her 23, 24, and 25-year-old self here.